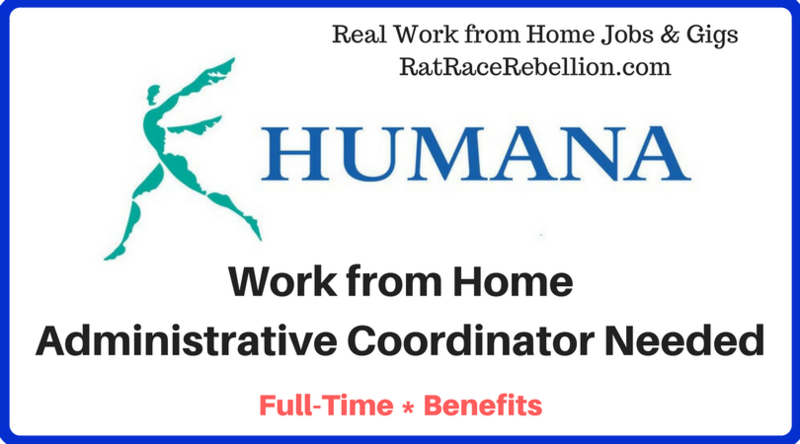 Healthcare giant Humana is looking for a work from home Administrative Coordinator. The company often hires home-based employees, and at any given time has hundreds of openings with benefits. Requirements include a high school diploma, a good knowledge of MS Office programs, the ability to maintain confidentiality, and a typing speed of at least 50 WPM. You’ll get extra points if you live in the Pacific or Mountain time zone, but it isn’t required. Same for an associate’s or bachelor’s degree. In this full-time job you’ll be doing such things as scheduling appointments, making travel arrangements, maintaining files, and handling letters and other correspondence. You’ll also communicate via telephone and in person to internal and external customers to provide guidance on Humana programs. Employee reviews on Glassdoor give the company 3.4 stars out of 5. To go to the job, click here. For many more work from home jobs with Humana, click here. Good luck! This entry was posted in Administrative & Clerical Jobs, Jobs with Benefits, Work at Home Jobs and tagged Humana. Bookmark the permalink.